Dueling frogs: do male green tree frogs (Hyla cinerea) eavesdrop on and assess nearby calling competitors? Individuals produce advertisement signals with intended purposes and targets. However, these signals can be received by “eavesdroppers,” who may extract information from them and alter their behavior according to the extracted information. In anuran systems, males congregate at breeding sites to produce advertisement calls to attract receptive females and fend off rival males. Both sexes directly assess these calls in dyadic encounters and make decisions based on the call’s characteristics, e.g., frequency. What is unknown is whether bystander males eavesdrop on these same calls to inform their future competitive decisions. Here, we examined whether male green tree frogs (Hyla cinerea) eavesdrop on competing males, assess their competitor’s call frequency, and respond accordingly. We exposed males to playbacks of two competing males that varied in call frequency—high, average, low—and quantified latency to call, time spent calling, and number of calling bouts. We found that males had reduced latency to call and called more when eavesdropping low-frequency competition, but not average or high-frequency competition. Focal male size also influenced how they responded, with larger males being more responsive than smaller males. 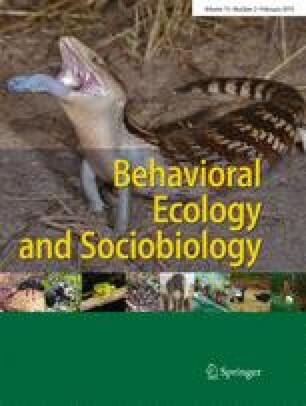 Our results indicate that male green tree frogs are capable of eavesdropping on nearby male calls and produce behavioral responses accordingly. Further, it appears males are able to alternate between assessment strategies dependent upon the frequency of the eavesdropped competition. These findings indicate that males not only directly assess an opponent’s call in dyadic encounters, but also indirectly through eavesdropping. Animals produce signals with intended purposes and targets, but which can be received by nearby eavesdroppers. Eavesdropped signals can elicit complex phenotypic changes in the eavesdropper, and lead to significant fitness consequences for the signal producer and eavesdropper. Thus, examining whether and to what extent individuals eavesdrop is an important step in understanding the evolution of signal production and response. Here, we examined whether male green tree frogs, H. cinerea, eavesdrop on nearby competing males and base their own calling behaviors on eavesdropped male’s calling characteristics. Calling behavior was mediated by focal male body size and eavesdropped male’s call frequency. Larger males reduced response latency and called more to nearby low-frequency males, while smaller males reduced response latency to nearby calls of average frequency. These results indicate that males will extract information from their competitive environment through eavesdropping and produce behavioral responses according to the eavesdropped information. We thank Salisbury University for providing funding for equipment and field vehicles. The Henson School of Science Guerrieri summer fellowship program provided support for TB and HB. We also wish to thank Matthew Murphy, Caitlin Minton, and Shelby Nicole Ferrell for their assistance with field collections. We are grateful to two anonymous reviewers for improving the quality of the manuscript. Handling and toe clipping were performed in accordance with The American Society of Ichthyology and Herpetologists’ “Guidelines for Use of Live Amphibians and Reptiles in Field and Laboratory Research.” All experiments were conducted under Salisbury University’s Institutional Animal Care and Use Committee (IACUC Protocol # SU 0036).